Lil Kim Rose of Sharon is a dwarf rose of sharon bush. 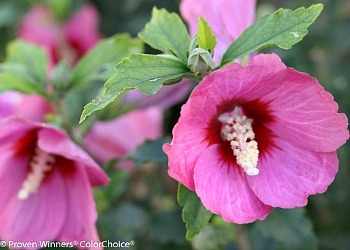 The Lil Kim Hibiscus Series are small, compact growing flowering shrubs that grow into the 3 to 4 foot height range. The rich carmine red flowers on the Lil Kim Red are striking against the deep green foliage. Red flowering shrubs are becoming popular, once again, in garden settings. The Lil Kim series is excellent as a dwarf red rose of sharon hedge where a lot of height isn't needed. Long summer flowering shrub. ​Also available the Lil Kim Violet and Lil Kim Hibiscus which is a white flowering rose of sharon. Lil Kim Red Hibiscus is grown in a quart size container. Orders shipping to AZ and CA will be bare rooted before being prepped for shipping.